The Outlook For U.S. Hotel Profits In 2018 – By Robert Mandelbaum and Bram Gallagher Ph.D. Since 2014, U.S. lodging industry owners and operators have seen a steady decline in the pace of revenue growth. In 2014, rooms revenue per available room (RevPAR) increased by a healthy 8.2 percent according to STR. Per the December 2017 edition of CBREs Hotel Horizons®, RevPAR is forecast to increase by just 2.5 percent in 2018. Facing lackluster revenue growth, hoteliers sights are now focused further on down the operating statement to determine what the impact of slow top-line gains will be on bottom-line profits. 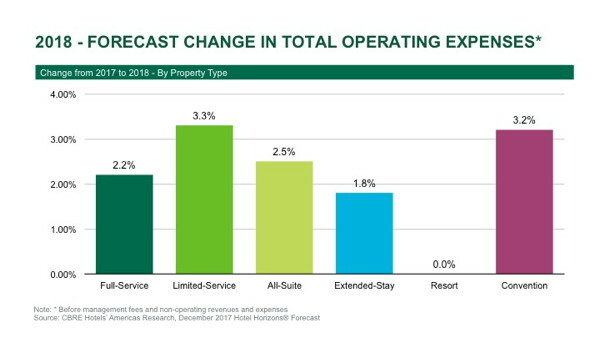 To provide U.S. hotel owners and operators with a sense of expected movements in hotel profits, CBRE Hotels Americas Research has developed a method to translate the RevPAR forecasts generated by its Hotel Horizons® econometric model into projected changes in total operating revenues, expenses, and profits. For this article, we analyzed the historical relationships between changes in revenue, expense, and profit data captured by property type during CBREs annual Trends® in the Hotel Industry survey, to historical movements in national occupancy, average daily rate (ADR), and RevPAR data provided by STR. 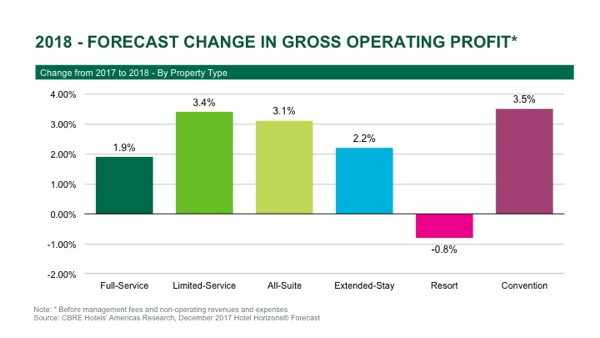 The results were forecast changes in hotel revenues, expenses, and profits, by property type for 2018. Profits are defined as gross operating profits (GOP), or income before the deduction of management fees, and non-operating income and expenses. National chain-scale forecasts of RevPAR were relied upon to generate the GOP forecasts. The chain-scale composition of the properties that voluntarily submitted data for the Trends® survey was used to weight the national RevPAR forecasts for each respective property type category. Accordingly, the historical series of data used to prepare the forecast does differ from the historical data presented in the Trends® reports. In 2018, the diametric pair of large convention hotels, along with smaller limited-service hotels, are forecast to enjoy the greatest increases in GOP. Conversely, resort properties are projected to suffer a slight decline in profits during the year. For 2018, convention hotels are forecast to achieve a 3.5 percent increase in GOP, the greatest gain among the six property type categories. During the year, convention hotels are expected to also realize the highest property type occupancy level (73.5%). Given the extensive level of services and amenities offered at convention hotels, the relatively strong 3.2 percent forecast increase in operating expenses is of great concern. Fortunately, the high occupancy level should give convention hotel managers the leverage to raise their ADR 3.5 percent, and therefore achieve sufficient flow through to generate the 3.5 percent increase in GOP. By definition, limited-service hotels provide a limited extent of amenities to their guests. Therefore, any increase in occupancy will result in a rise in the variable costs associated with serving the additional guests. 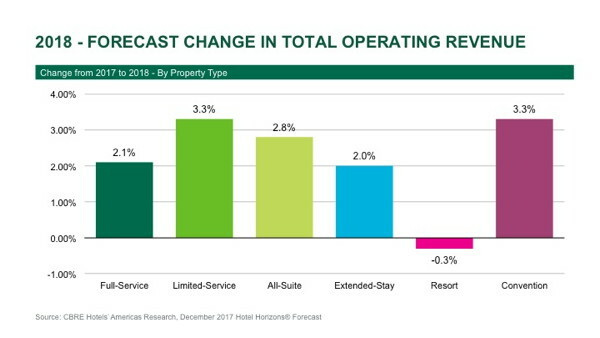 For limited-service hotels in 2018, CBRE is forecasting a 0.3 percent increase in occupancy, which should result in a 3.3 percent rise in operating expenses. This is the greatest forecast change in expenses among all property types. Fortunately, as is the case with convention hotels, a relatively strong ADR forecast of 3.1 percent should overcome the growth in expenses, and result in a 3.4 percent increase in GOP. Like convention hotels, resort properties offer their guests multiple services and amenities. Resorts rely on high guest counts to patronize their extensive array of food and beverage, retail, entertainment, and recreational outlets. With a projected 0.5 percent decline in occupancy (and therefore guest count), plus a forecast of no ADR growth, resort hotels are expected to suffer a 0.3 percent decline in total revenue for the year. Therefore, despite holding operating expenses to 2017 levels, resort hotels are forecast to experience a 0.8 percent decline in GOP during 2018. For extended-stay, full service, and all-suite hotels, the ability to hold expense growth to roughly the pace of inflation (1.9%) will enable these property types to achieve GOP gains in 2018. Among all six property types, occupancy levels are expected to increase the most at all-suite hotels during 2018. Despite the forecast 0.4 percent rise in occupancy, the growth in operating expenses is projected to be limited to 2.5 percent. Expense controls, plus a 2.5 percent increase in ADR, should allow for a relatively healthy 3.1 percent increase in GOP. Extended-stay hotels are forecast to benefit from a 0.3 percent boost to occupancy during 2018. With the limited amount of housekeeping and laundry services provided at extended-stay hotels, increases in occupancy do not impact the variable expenses as much as they do at other property types. Therefore, operating expenses are forecast to increase just 1.8 percent for the year, allowing for 2.2 percent growth in GOP. Total revenues at full-service hotels are expected to grow just 2.1 percent in 2018. The limited revenue growth is partly attributable to the 0.3 percent forecast decline in occupancy. The forecast decline in occupancy will allow management to limit expense growth to 2.2 percent, but with expenses growing at a greater pace than revenue, GOP is forecast to increase by just 1.9 percent during the year. U.S. hotel operators have had a long history of adapting to periods of strong positive, and negative, changes to the economic and market environments in which they operate. Expenses are cut during recessions. Valuable new services and amenities are added to generate additional revenues during periods of prosperity. CBRE is projecting an operating environment for the foreseeable future that provides the opportunity for hotels to achieve modest gains in both revenues and profits. However, to achieve these gains, management must pay close attention to the basics of revenue management and cost controls. Slight adjustments to ADR, or expenses, can have a significant impact on changes at the bottom-line. Robert Mandelbaum is the Director of Research Information Services for CBRE Hotels Americas Research. Bram Gallagher Ph.D. is an economist with the firm. To benchmark the revenues, expenses, and gross operating profits of your properties, please visit https://pip.cbrehotels.com/benchmarker, or call (855) 223-1200. This article was published in the March 2018 edition of Lodging.